Enrique Iglesias picked up his first Latin Grammy in more than a decade Thursday, winning three trophies including song of the year for his platinum hit, "Bailando," while Calle 13 set a record for most Latin Grammy wins with 21. Iglesias accepted his awards from Paris, where he was tour. "Bailando" also won best urban song and performance, beating out Latin Grammy favorites Calle 13. Iglesias won his first Latin Grammy - and only one before Thursday - in 2003 for best male pop vocal album for "Quizás." Calle 13 walked into the MGM Grand Garden Arena in Las Vegas as the top competitors. Eduardo Cabra of duo was nominated for 10 awards, including producer of the year, while the group was up for nine, including album, song and record of the year -- all of which they lost. Instead, Paco de Lucia - the celebrated guitarist who died earlier this year - won album of the year for his final effort, "Canción Andaluza." The album also won best flamenco album, an award de Lucia won twice throughout his career. Juanes, who was originally tied with Calle 13 with 19 Latin Grammys before Thursday, won best pop/rock album for "Loco De Amor," giving him a career total of 20. 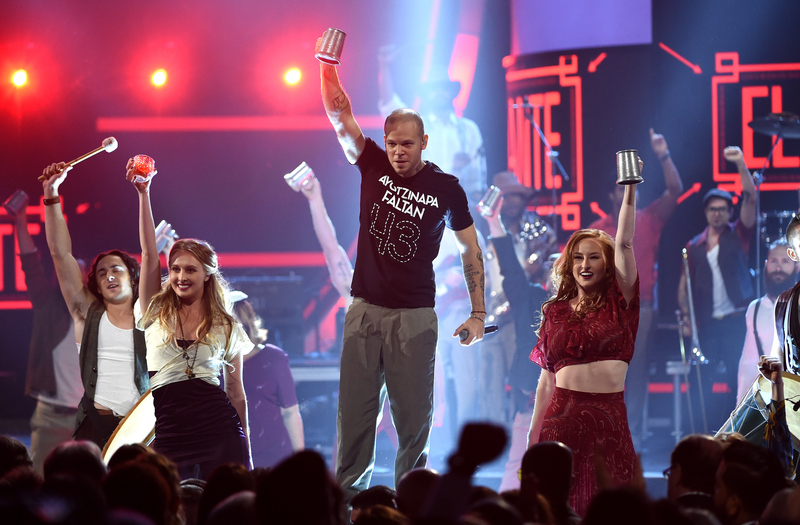 Calle 13 kicked off the Latin Grammys by giving a strong performance that looked like it was inside an Irish bar and wins for best alternative song for "El Aguante" and urban music album for "Multiviral," their fifth album but first to be released on their own label. "We are happy. We have 21 (Latin) Grammys and it is a dream. We never thought we would have this in our lives," Calle 13 vocalist Rene Perez told reporters backstage. A taped performance of "Bailando" from Iglesias closed the three-hour show, which aired live on Univision and was delayed about 17 minutes because of President Barack Obama's speech on immigration. "Bailando," which features Gente de Zona and Descemer Bueno, has sold more than 1.2 million tracks in the United States and peaked at No. 12 on the Billboard Hot 100 chart. The song is the longest-running No. 1 hit on Billboard's Hot Latin Songs. Jorge Drexler was a double winner Thursday night, taking home record of the year for "Universos Paralelos" with Ana Tijoux and best singer-songwriter album for "Bailar En La Cueva." Marc Anthony, who got married earlier this month, won best salsa album for "3.0." He performed with reggae-pop band MAGIC!, singing a Spanish version of their worldwide hit, "Rude." The night featured a number of collaborative performances: Rockers Camila, who won best contemporary pop vocal album, performed with Ricky Martin; R&B singer Chris Brown sang alongside Pitbull and Wisin; and Pitbull returned to the stage to rap next to guitar maven Carlos Santana. Venezuelan singer-songwriter Mariana Vega won best new artist and the icon Joan Manuel Serrat, who performed, was named person of the year. Iglesias was nominated for five awards. "Bailando" lost record of the year and his other tune, "Loco," lost best tropical song to "Cuando Nos Volvamos A Encontrar," Carlos Vives' song featuring Anthony. Vives shared the win with co-writer Andrés Castro. Vives, who was the big winner at last year's Latin Grammys, also won best contemporary tropical album for "Más + Corazón Profundo."